My Dad spent many a Christmas Eve with us. I would cook up a Christmas feast which sometimes included a roast goose and all the fixings. We would take our time sharing gifts and enjoy a yule log fire. My husband, Dennis, would set aside a special log sometime during the year when he was splitting wood. When we sat down to open gifts, he would light the fire then we would each write a wish on a piece of paper and toss it into the flames. Before the designated yule log burnt up completely, Dennis would make sure a chunk of the charcoal was saved. 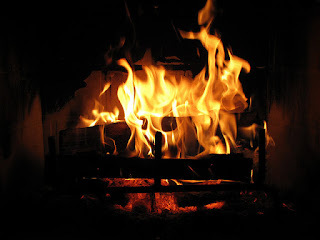 The following Christmas Eve, he used the old yule log chunk from the prior year when he set the new yule log on fire, thereby continuing our good wishes from year to year. After Dad died, we were left with a sense of sadness with the first Christmas Eve without him. Instead of doing what we had been doing with my Dad, we were determined to start new traditions and make new memories. I haven’t roasted a goose or have had a yule log fire in twenty-five years. When I look back over the years since Dad died, I can see making new traditions was just what we needed to do to help move us forward. The holidays can bring up many memories. How about allowing for a season of change? It’s time, and it’s okay for you to enjoy the holiday season. Start by making new traditions and wonderful memories for the future. During this holiday season I wish you all the best calm and all the best bright!